Pakistan’s foreign minister Khawaja Asif has, on Wednesday, announced that Islamabad has made clear to the US that it will not accept India as a “policeman” in the region. He has also conceded that relations between Islamabad and Washington were not cordial and in fact US administration was hiding its failures by blaming Pakistan on fight against terror. 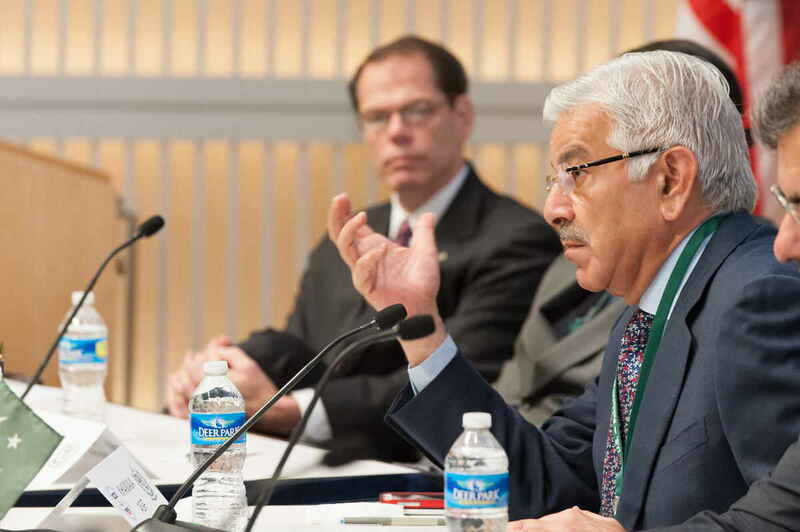 According to The News International, Khwaja Asif was closing debate among the senators about US Secretary of State Rex Tillerson’s recent visit to Pakistan. He has expressed his displeasure on Trump administration’s policy tilt towards India. He said that Pakistan has made crystal clear to the US that its wish to appoint India as a ‘policeman’ in the region was in no way acceptable. Asif was quite vocal in criticising US for hiding its failures. He said, “when the US holds Pakistan responsible, it, in fact, tries to brush its own defeat under the carpet”. Asif said that Pakistan was ready to play its due role in restoration of peace in Afghanistan through the platform of the Shanghai Cooperation Organisation (SCO). During the debate senators criticised US President Donald Trump for his new South Asia policy. Meanwhile, Dawn correspondent Anwar Iqbal reports from Washington that US has shared a list of 20 terrorist groups operating in Pakistan and Afghanistan. He claimed that unnamed diplomatic sources have rejected the suggestion as incorrect that Rex Tillerson handed over a list of 75 terrorists to Pakistani officials. US Secretary of State Rex Tillerson told Senate Foreign Relations Committee on Monday that Pakistan was willing to target terrorists if provided specific information and Washington plans to give Islamabad an opportunity to do so. The report further said that the list of 20 terrorist groups includes three types of groups: those indulged in attacks into Afghanistan, those who target attacks in Pakistan and the groups focussed on Kashmir. The US has identified Lashkar-e-Taiba, founded by Hafiz Saeed in 1987, as one of the largest and most active terrorist organisations in South Asia. This group is also focussed on Kashmir and it was involved in the 2001 parliament attack in New Delhi and 2008 Mumbai terror attacks. Earlier in September, BRICS leaders, at the end of their summit held in China, had named Pakistan based terrorist outfits like Lashkar-e-Taiba and Jaish-e-Mohammed among groups responsible for committing, organising or supporting terrorist acts. Previous storyIs India’s optimism over Iran’s Chabahar port grossly misplaced?